Tuesday, May 21 from 1:15 – 2:15 p.m. Your time is valuable – Finding the right exhibitors is easy! The results display a list of matching exhibitors, and their booths are highlighted on the floor plan. Print and Go! Large Exhibit Hall maps at each entrance provide an overview before you go in. Exhibit Hall WayFinders are located in several locations on the exhibit floor so you can find exhibitors quickly and easily once inside the hall. Sunday, May 19, 2019- 10:30 a.m. to 3:30 p.m.
Monday, May 20, 2019- 10:30 a.m. to 3:30 p.m.
Tuesday, May 21, 2019- 10:30 a.m. to 3:30 p.m.
Unopposed Exhibit Hall hours are 1:15 to 2:15 p.m. each day. No educational sessions are programmed during this time. 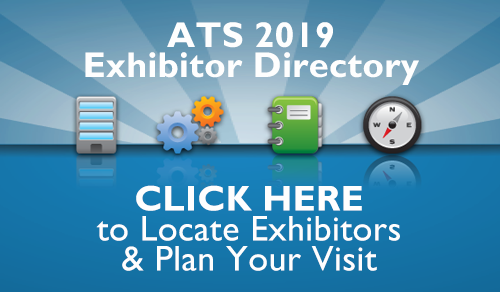 Play Discovery Quest on the ATS 2019 mobile app for a chance to win an Apple watch (one prize per day) visit participating exhibitors and answer the questions correctly for your chance to win. Obtain patient information from the Public Advisory Roundtable (PAR) exhibitors.